Denville, NJ, April 13, 2016, Dr. Sunita Kanumury, MD, FACAAI of Asthma & Allergy Care, has been recognized by Elite American Physicians for her dedication, achievements and leadership in health care. Motivated by her own experience with asthma and allergies, Dr. Kanumury has been providing quality care, attention to detail and prompt service to members of Northern New Jersey for more than 23 years. Her goal has always been to provide individualized care to every patient and to serve as an ongoing educational resource in the Northeast United States as it pertains to progressive and effective asthma and allergy care. This year, Dr. Kanumury is proud to open her fifth health care center for allergy and asthma care, located in Bernardsville, NJ. This location joins the established and successful centers in Denville, West Hackettstown, Newark and Union. “Our solid reputation of customer satisfaction has enabled us to reach more and more patients needing quality care in the region,” Dr. Kanumury says. Dr. Kanumury is board certified by the American Board of Allergy and Immunology and she is regarded in her professional community through her affiliations with the Association of Allergists & Immunologists from India and the American Association of Indian Physicians. Prior to establishing her practice, Dr. Kanumury earned an MD and completed two residencies at Our Lady of Mercy Hospital in NY and the Medical University of Ohio. Thereafter, she was a fellow of allergy immunology and infectious diseases at the University of Medicine and Dentistry of New Jersey. Recognized as One of America’s Top Physicians of Allergy and Immunology by the Consumer Research Council of America, Dr. Kanumury plans to continue offering quality health care in the years ahead. 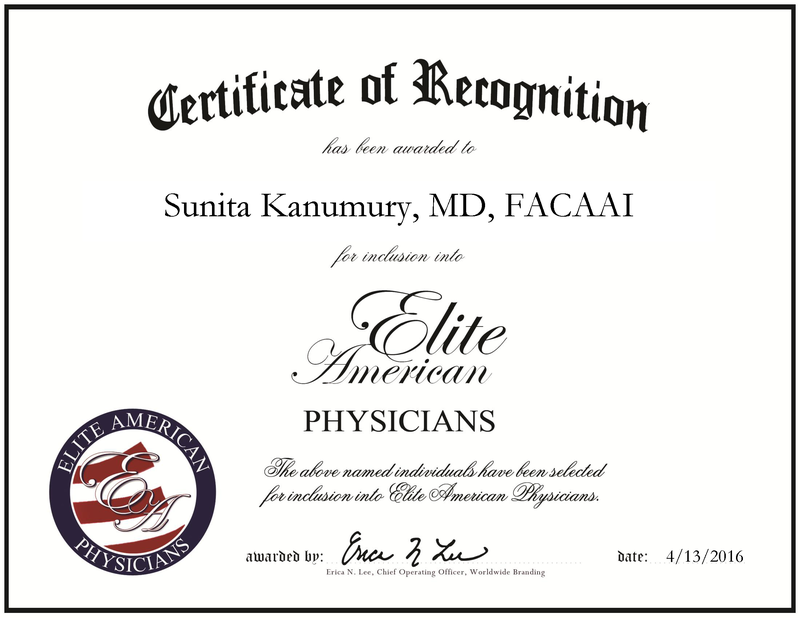 Dr. Sunita Kanumury was originally selected for inclusion in EliteAMERICAN Physicians in 2014. We are proud to be featuring Mr./Ms. [name] again in EliteAMERICAN Physicians for 2016. This entry was posted in Immunology and tagged allergies, Asthma, Immunology, infectious diseases, resource. Bookmark the permalink.